The Institute of Gandhian Studies (Gandhi Vichar Parishad) is an educational and public charitable institution that has been set-up one of the commemorative projects of the Jamanlal Bajaj Centenary Year. The objectives of the Institute identify the growing relevance of Gandhiji and the need for the need for providing opportunities for the study and application of his thought and methods. More than five decades have passed since Gandhiji fell to the bullets of an assassin. But every year in these decades has only heightened the global awareness of the dimensions and the meaning of his message. A very real threat to survival is threatening humanity to look for alternative to the paths that have led it to the brink of extinction. Violence and war seem to have become counter-productive as instruments for settling differences or resolving conflicts. Giant strides in science and technology have no doubt added to the knowledge and power at the disposal of man, but not to the peace of mind in the individual or harmony in society, nor to the liquidation of want and poverty, illness and ignorance. New means for the resolution of conflict and difference in opinion and outlook. Values that will promote individual liberty and progress while strengthening the forces of cohesion. A new blend of the spirit of science and the role that man has inherited consequent on his entry into realms that give him access to the power of the spirit. A new technology that will no longer result in alienation, robotization, dehumanization and exploitation, but enable man to exercise his creative talents and achieve liberty and equality. A new era in which government will rest on the principles of self-government, and humanity will out-grow narrow loyalties that can place a question mark before the survival of man. 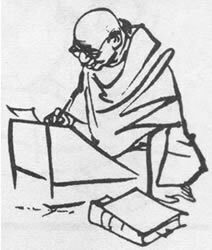 Many thinkers and activities, in the world today, have begun to turn to the life, thoughts and methods of Mahatma Gandhi to look for solutions that can take humanity in this direction. Many countries have witnessed popular movements for freedom, equality and peace, which drew inspiration from the life and methods of Gandhi. Activities and thinkers of younger generation in the world looking to the alternative path that Gandhi showed, in the belief that his message and testament are of crucial significance to the survival of mankind. Of all the influences that contributed to the making of the personality of Shri Jamnalal Bajaj none was greater than his close association with Gandhiji, and his implicit faith in the epochal significance of Gandhiji’s life, message and the Concept of Trusteeship. He asked Gandhiji to consider him as the Mahatma’s fifth son, preserving and transmitting the heritage of Gandhian thought to succeeding generations. The establishment of the Institute was thus a fitting memorial to the life and work of Shri Jamnalal Bajaj in this Birth Centenary year. The Gandhiji Vichar Parishad has its roots in the early fifties, when some close associates of Gandhiji decided, shortly after his death, that there was a need for an institution which would undertake the scientific study and analysis of Gandhian Thought and methods for the benefit of the younger generation. The founding members included such eminent Gandhian scholars as Acharya J.B.Kriplani, Kaka Saheb Kalelkar, Shri J.C.Kumarappa, Shri K.G. Mashruwala, Shri Shankar Rao Deo, Shri G.Ramachandra and Shri Ravindra Varma. Kaka Saheb Kalelkar was its first Chairman, and Shri Shankar Rao Deo and Shri Ravindra Varma were Sceretaies. The march of history and the demands of organization caused the Parishad to be merged into the Gandhi Smark Nidhi as the Tatva Prachar Vibhag (Ideology dissemination Department). The Gandhi Vichar Parishad or the Institute of Gandhian Studies in its present form was established at Wardha in October 7,1987. Intially the Institute started its activities within the Campus of Mahatma Gandhi’s Ashram at Sevagram. In the course of time, it has been moved to its new campus at Gopuri. Shri Ravindra Varma, freedom fighter, Gandhian activities and scholar was until recently the Chairman of this Institute .He was the prime mover whose vision and work resulted in the establishment of the Gandhi Vichar Parishad with the active interest and full support of Shri Ramkrishna Bajaj, the then Chairman of the Jamnalal Bajaj, the then Chairman of the Jamnalal Bajaj Foundation. The Board of Trustees of the institute at present consists of Retd. Justice C.S.Dharmadhikari, Chairman, Shri Ravindra Varma , Shri Narayan Jajoo, Shri Dhirubhai Mehta, Shri Rahul Bajaj and Shri Shekhar Bajaj. The objectives of the Institute are clearly reflected in the courses of study and guidance that it offers, both to the younger generation and to the more mature activists and workers.